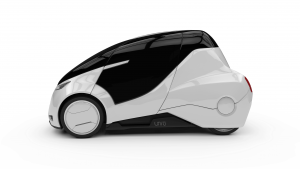 Residents of Lund city might have heard about a company called Uniti, who is developing a new type of short-range electric city car. What's impressive with Uniti is its way of developing, namely, open-source approach. OCVehicle's TABBY EVO is an another one. They are developing open source Vehicle Development Kit (VDK) for electronic vehicles (EV) and many projects are coming out from their platform. Such new movements in the rigid car industry are more than welcome, and those new comers seem to attract urban millennials who are conscious about environmental issues and curious about new technologies by presenting futuristic stylish cars. Japanese Rimono, on the other hand, has a quite different starting point and approach to same short-range electric city vehicle category. This two-seater EV (still a concept car and was revealed this spring in Tokyo) was designed especially for young mothers or senior citizens who may not be very good at driving but need a kind of vehicle for their dairy life. 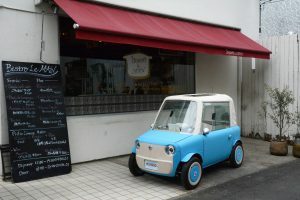 The CEO of Rimono, Sunsuke Ito, aimed to attract those people who are out of current EV market, by creating a CUTE ("KAWAII") car with fabric exterior that gives soft impression and easy to fit into urben environments. The company Rimono itself is a fabless venture, and they believe in the collaboration with small town manufactures together with Japanese enterprise specialized in cutting edge material technologies. Just watch below video to understand how they achieve this. Rimono is hoping Japan to adopt similar standard to Europe's L6e, that will allow them to launch a car similar to what you see in the video in near future. Enjoy the video! Rimono is so cute!